Hypnos Recordings has established a reputation as a reliable and yet daring explorer of atmospheric and minimal ambient recordings. Our customers have requested that Hypnos give expression to more dynamic forms of electronic music, everything from experimental electronica, to more rhythmic ambient music, and classic European-influenced e-music. To that end, we established BINARY, to give voice to artists working in forms more kinetic than would have fit with Hypnos. 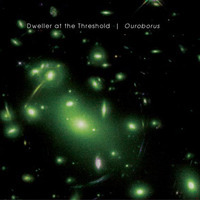 OUROBORUS by Dweller at the Threshold is the first Binary release by a group whose members include Dave Fulton (whose collaboration THE MOST DISTANT POINT KNOWN with Hypnos founder M Griffin was released on Hypnos in 2000), Paul Ellis (whose solo INTO THE LIQUID UNKNOWN is the Binary label debut), and John Duval. The first Dweller album, NO BOUNDARY CONDITION (Eurock) had a strong Tangerine Dream influence, but the group has since moved further into deeper space. One feature identifying Dweller's sound is the heavy use of analog modular synthesizers. Fulton relies on a refrigerator-sized bank of Doepfer modulars and a Synthesis Technologies (MOTM) system. Duval uses "The Fist of God," a massive Serge Modular. The use of all this expensive, esoteric analog synthesis gear is no mere "synth geek's vanity" -- the sound of Dweller at the Threshold possesses a character and clarity that would simply not be possible with modern digital synthesizers. An audience member at a recent DATT concert in Portland was overheard afterward saying "I haven't heard something that good since Tangerine Dream was young." "Once again, the past comes to our rescue with the Dweller at the Threshold release Ouroboros. As so many of today's artists in electronic sound have been influenced by the classic cosmic music of the 1970s, so has Dweller at the Threshold. The great thing about DatT is that this group has captured the mood of the era without becoming a cliche. DatT explores this realm of music while retaining their own true voice." CD, should really create some buzz for the new Hypnos sub-label, Binary. Well done, guys." Dweller at the Threshold set out to create an exploratory and spacey electronic recording and succeeded...."